Brendan Gerdes is an associate in the Litigation practice. While in law school, Brendan earned numerous awards in moot court and trial advocacy. He came in first place in Northwestern's 2017 Julius H. Miner Moot Court Competition and, as a member of the National Moot Court Team, Brendan won the American College of Trial Lawyers 68th Annual Moot Court Competition. He also won a championship as a member of the Bartlit Center Trial Team, where he was named the competition's Outstanding Advocate. 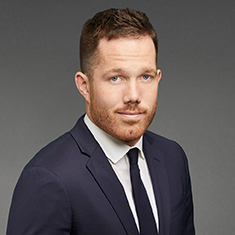 Additionally, Brendan worked in the Bluhm Legal Clinic's Federal Appellate Clinic and Center for Criminal Defense, and he served as the criminology production editor for Northwestern's Journal of Criminal Law and Criminology. Shown below is a selection of Brendan’s engagements.